1. Hydraulic transmission is used as power resource for this track loader. 2. 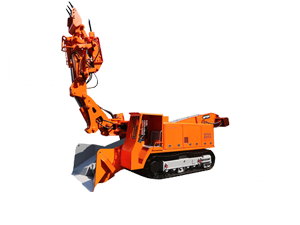 Crawler mucking loader LWLX-100-45L is suitable for horizontal tunnel construction. The maximum working scope it can be used is 15°. 3. This hydraulic transmission system is with low emission and low loss. 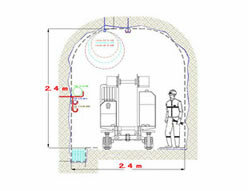 Air quality inside constructed tunnel is controllable. 4. Duckbilled shovel mouth increases working efficiency. Crawler loader LWLX-100-45L can finish collecting and loading materials with little human assistance. 5. We employ latest three arms combination, which has more wide coverage than traditional two arms design. 6. Discharging height and distance of conveying trough can be customized. 7. Excavator bucket and conveying trough is made up of imported heavy duty and wear plate. This truck loader adopts CO2 continuous welding technique to increase anti-fatigue performance. 8. Hydraulic operation rod and pedal plate which are imported from Korea, are simple to operate. 9. Maintenance is easy and convenient, since the equipment can be greatly opened on both sides and maintenance points are within in touch. 10. Crawler mucking loader LWLX-100-45L is safe to use. The machine is equipped with safety bell and emergency stop switch.